A Man Purse: Deal Maker or Breaker? When I was young, I swore I’d never marry a farmer. Hearing my parents talk about “$10,000 rains” and having to “wait and see if we have a good crop” before I could get the hand-held Space Invaders game was too much for me. Plus, I didn’t want someone who knew the entire history of my family and our pets before he met me. I mean, what would we talk about on Date 6? Of course, I ended up dating a farmer, and a nice one at that, but I never married him. I had, after all, made a childhood pledge. When M.E. 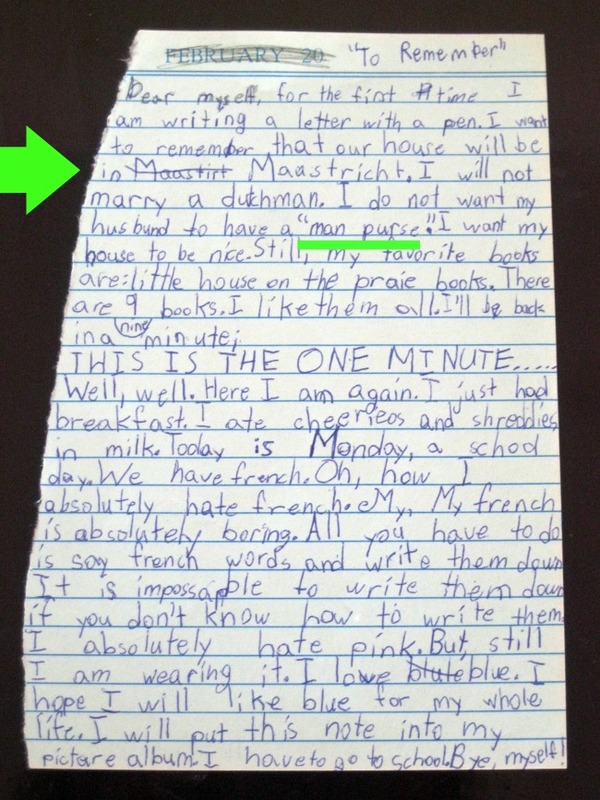 was eight years old, she too made a promise about who she wouldn’t marry. I’ll let her mom, Jennifer, tell the story. At one point some friends worked themselves into hysterics imagining the fashion affectations my husband (your basic khakis kind of guy) would be sporting the next time they saw him. Italian leather shoes! Over-gelled, highly tousled hair! A speedo! A man purse! The man purse is a deal breaker. Part of me agrees. Does a woman want a man who spends more on accessories than she does? If her husband has his own purse, would he still offer to carry hers when she’s toting their baby around? Oh, how I absolutely hate French. My, My French is absolutely boring. All you have to do is say French words and write them down. It is impossible to write them down if you don’t know how to write them. M.E. is going places. She knows what she wants in a man, she can spot circular reasoning, and she can write. Ode to clever kids with fashion sense. Posted on June 14, 2011, in Diaries and Journals and tagged Chase McFadden, Dutchman, funny, funny kids, kid writing, Kids, kids diaries, Leanne Shirtliffe, man purse, marriage, Netherlands, Stuff Kids Write, Stuffkidswrite.com. Bookmark the permalink. 11 Comments. Clever girl, and a future writer, for sure! I wish I had written odes to self when I was her age. It’s okay, M.E. I hated French too. Reminds me of a recent FB debate about man capris. I almost felt bad for the one person who liked that her husband wore them. Um…. That’s cool just not for me. Same for man purses. Well, well. Talk about poppin’ voice! At 8? Love the man purse. Love the minute time-out (documented). Love the “Oh, how I…” Love the absolutely. Sure the initials weren’t CB (Carrie Bradshaw)? We need more from this girl, I know that. I especially enjoy the quotation marks around “man purse”. If she was talking, she would be air quoting the crap out of that phrase. Nicely done. Also, Little House on the Prairie are still my favourite books. I’m just putting this out there for all men. No woman likes a man with a man-purse. We get stuck with them. Two snaps for Li’l Miss Thang. She had opinions. So much love and so much hate. I am left wondering how she felt about French-kissing. You know, later on. I love how she slips in her favorite books in her diary. Little House books are some of my favorites too! She is a very sensible girl, much like Laura now that I think of it! Like M.E., I don’t enjoy French, especially when my children make fun of my deplorable accent. I also loved the “Little House” books…my Grandma got a boxed set of eight books for my eighth birthday…30+ years later, my darling daughters lost two of them on a trip to visit their aunt. A “man purse” would be a good idea for my Jim…that would keep me from having to carry all his crap in my giant purse!